The Strength for Service Society was established in 2015 to recognize generous supporters who have made planned gifts to Strength for Service, Inc. Membership in the society is granted to supporters who notify us that they have included Strength for Service in their estate plans. No other documentation is required. First published in 1942 following the attack on Pearl Harbor, Strength for Service to God and Countryprovided daily inspiration to fighting forces during World War II and the Korean conflict. The book went out of publication in 1953. Members of the Strength for Service Society want to guarantee that the historic volume will never go out of print again, and they want to leave a legacy of providing spiritual resources for members of the U.S. Armed Services, first responders, and other community servants. The first 100 persons who join the Strength for Service Society will become charter members, and they will be honored at occasional regional and national events. Charter members will also receive attractive embossed certificates. To become a member of the Strength for Service Society simply indicate, by mail or e-mail, your intention to provide a planned gift through your will, bequest, or the assignation of a life-insurance policy. We do not need to know the amount of the gift or the percentage of the estate. If you agree, we will include your name in a listing of society members. No other details will be provided. 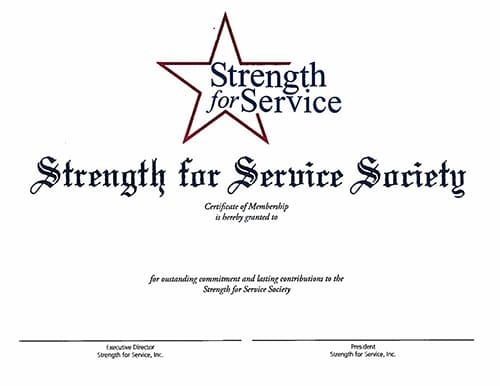 For information about becoming a member of the Strength for Service Society, contact Larry W. Coppock, CFRE, acting executive director: (615/ 620-7261) (lcoppock@gcumm.org) or write: Strength for Service, Inc., 1000 17th Ave. S., Nashville, TN 37212. Click here to read more about Cal Lackore, our first member of the Strength for Service Society.